Greetings! 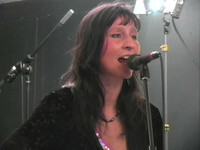 Thanks for visiting my site and thanks to all those who support live and recorded music! Still country-rockin' it on fiddle with the Thunder Ridge band! Also performing (and also still writing & hope to record soon) originals playing acoustic 12-string guitar with the help of JB Hunt on the acoustic bass guitar and Larry Balestra on hand percussion/drums. Excited about currently being considered and reviewed for a spot on NPR's Prairie Home Companion! We appeared on Nancy Fuller's Farmhouse Rules on the Food Network, which aired in July 2014. Some other highlights of the past few years include kicking off 2010 as a guest opener at Levon Helm's Midnight Ramble sessions the night before he won his 2nd Grammy award! And also, hats off to David Laks for inviting me to perform on Woodstock TV on "The Whatever Show" (see box on right). Loved performing with Kurt Henry, the John St Jam, the Rosendale Street Festival and the Kingston Folk Festival (featuring Aztec Two-Step and members of the Mammals), as well as the recent concert in Bethel Woods for a recreation of .The Last Waltz., Hudson Valley Bounty Chili Cookoff, Hudson Valley Rib Festival, and many fairs and festivals just to name a few of the many shows over the past few years. Click here to watch a video produced at the Albany School of Radio and Television featuring Dorraine's song "It Doesn't Matter". Click here to watch Dorraine's appearance on The "Whatever Show" hosted by David Laks and also featuring band members JB Hunt on Bass, Larry Federman on guitar, and Larry Balestra on percussion.